The Fargo-Moorhead RedHawks re-acquired Will Solomon on January 30, 2018 in a trade with the Lincoln Saltdogs. Solomon, 25, joined the RedHawks in June of 2016 after the San Diego Padres, who drafted him in the 38th round of the 2016 MLB draft, declined to sign him to a contract. 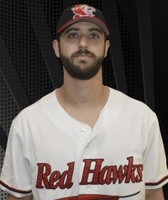 Solomon pitched in 24 games (16 starts) with the RedHawks going 5-5 with a 4.47 ERA giving up 58 runs (52 earned) over 104.2 innings pitched. Solomon struck out 69 and walked 40. Before being drafted, Solomon pitched for two years at Kennesaw State University (GA) where he went 4-5 over 37 games (9 starts) with a 4.34 ERA.